It has been a little over a year since I installed three new Dell Optiplex 755 systems (see my earlier review here and here). A memory problem in one of the systems and a moaning power supply fan in another (oddly, not from cat fur) caused me to open a support case with Dell for replacement parts. This lead to the dreaded “since I’m in here, I wonder what I could do to improve things” thoughts. Since I purchased these systems a year ago, a number of faster components have become available, or have had major price reductions. The main items that I wanted to speed up were: hard drive, video and CPU. I’ll discuss each of these in turn. As I mentioned in my previous articles, I’ve been very loyal to Seagate in the past. However, they’ve fallen on their face in a number of areas recently. First, they dropped the warranty on many of their drives from 5 years to 3 years. Second, they have had some heavily-publicized firmware problems, including a “fix” that rendered some classes of drives completely non-functional. Plus, drives from other vendors out-perform the Seagate products at certain capacities. One of these is at the 250-300GB range, where Western Digital offers the VelociRaptor™. This drive is offered in 3 configurations, which differ only in the way the drive is mounted. The BLFS version is a bare 2.5″ drive, good for servers with backplanes that require this size drive. It won’t work in a notebook as it is much taller than a normal notebook drive (15mm vs. the normal 9.5mm for a notebook drive). 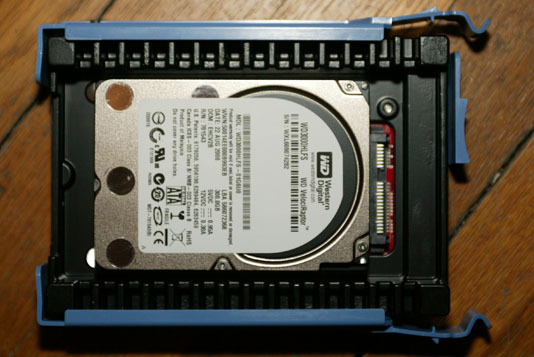 The GLFS version is the previous drive mounted in a 3.5″ frame (which WD calls an IcePack™). 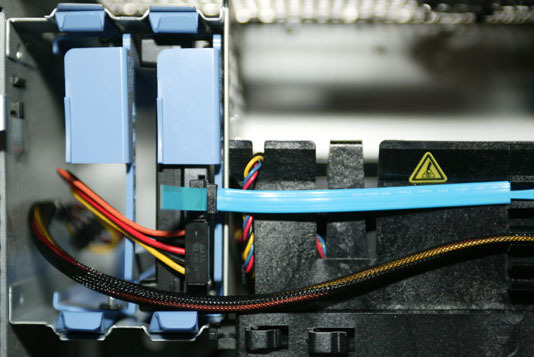 However, due to the industry standards for location of the SATA power and data connectors differing for 2.5″ and 3.5″ drives, this version cannot slot in to an enclosure that has backplane connectors for 3.5″ drives. This brings us to the HLFS version, which is similar to the GLFS except that the bare drive is mounted in a slightly different location on the IcePack and there is a passive adapter board which has the connectors in the right spot for mating with SATA backplanes. Since many online merchants list the GLFS and the HLFS at the same price, I don’t know why WD bothers with the GLFS version. There are apparently some minor cooling differences between these versions, but I don’t feel they are enough to justify keeping the GLFS around. I purchased the HLFS version as the Optiplex has a rather unusual mounting (side-to-side vs. the more common front-to-back) orientation and the cables would line up better. Plus, it would keep my options for future re-use of the drive open. These systems originally shipped with ATI Radeon HT 2400 XT cards. As I mentioned in my earlier review, that card didn’t support the Dual Link DVI mode that I needed to operate the 3008WFP monitor at its maximum resolution of 2560 x 1600. I replaced it with a different version of the HD 2400 that supported Dual Link. Since then, there have been a number of additional generations of ATI video cards. Unfortunately for me, most of these are dual-slot configurations due to the large fans found on the card. In the Optiplex 755, the video card occupies the uppermost slot in the chassis and there’s no place for the second bracket to go. And that is the only PCIe x16 slot on the chassis. Looking around, I found the Radeon 3650 which was a single-slot solution. It supported the Dual Link DVI that my monitor required. It also supported the DisplayPort interface which was also found on my monitor. 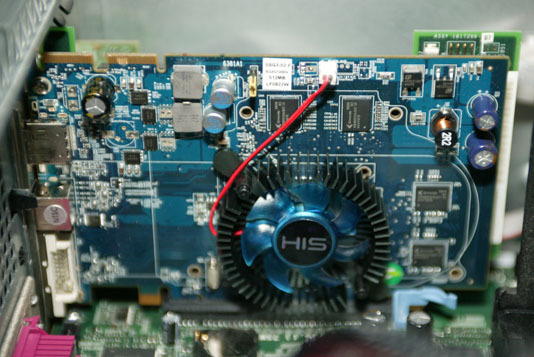 As finding “Built by ATI” video cards is getting harder and harder, I selected the HIS H365F512DPNP card. I have some Cyberlink software installed on this PC which requires a HDCP link to the monitor. Unfortunately, the 3008WFP monitor doesn’t support HDCP when operating in Dual Link mode, so I have to drop the resolution down to 1920 x 1200 or I get an annoying message about my display not being supported and then playback stops. Since I now had both a monitor and a video card that allegedly supported DisplayPort at 2560 x 1600, I gave that a try. It was a total failure – the display would go into screen saver mode immediately at that resolution. At lower resolutions it would randomly cycle in and out of screen saver mode every few seconds. So much for that idea – back to Dual Link DVI. The monitor is revision A01, which according to Dell has no issues with DisplayPort. But this technology seems to not be ready for deployment. I had ordered the systems with the Core 2 Quad Q6600 CPU as the only faster quad core part offered by Dell at the time was the Q6700 which wasn’t a lot faster (2.66GHz vs. 2.40GHz) and which was a lot more expensive. Since then, Dell started offering parts in the Q9xxx family. However, the top-of-the-line Q9650 still isn’t available from Dell in these systems. The change from a 65nm feature size to 45nm means that despite the faster clock and larger cache, the thermal specification remains the same at 95W. This means that the existing CPU heatsink and fan could be re-used, which is important as the Optiplex 755 uses a custom cooling solution and not the heatsink / fan provided with the boxed CPU. Dell systems tend to not provide the assorted overclocking tweaks found on some motherboards, so this is likely as fast as this system is going to get unless Intel releases a faster CPU. I had spec’d PC6400 memory when I ordered the systems, and that is the fastest memory the Q35 chipset supports. With 4 matching 1GB modules, the memory runs in what Intel calls “Dual Channel Interleaved” mode, which is the fastest mode. Since the motherboard doesn’t provide tweaks, this CL5 memory is the fastest that can be installed in the system. (All of the memory I’ve found that runs at CL4 and faster still reports itself as CL5 in SPD and expects the tuner to override the SPD settings). The system is noticibly faster. Backups to my network file server run at around 70MB/second now, compared with 50MB/second before the upgrade. Windows startup is much improved. One thing I discovered when I re-installed Windows and all my software from scratch – I had previously thought that the Intel Ethernet chipset on this motherboard didn’t support jumbo frames (because the option didn’t appear in the configuration menu as delivered by Dell). But after installing the latest drivers from Intel, the jumbo frame option appeared and I enabled it. This entry was posted on Friday, February 6th, 2009 at 6:12 am	and is filed under Computers. You can follow any responses to this entry through the RSS 2.0 feed. You can skip to the end and leave a response. Pinging is currently not allowed. 2) You can adjust the CPU fan using HWiNFO. There are three settings – a faux 0 RPM mode, a 1200 RPM mode, and a 2400 RPM/”jet engine” mode. 0 RPM actually forces the fan to ~700 RPM, which is almost inaudible. 3) You can overclock your discrete graphics card. I use RivaTuner and I can easily overclock my HD 2400. Keep an eye on temps though and get GPU-Z at the same time. When installing RivaTuner, leave everything at its default. Ignore any warning messages about drivers. I find that the memory can be easily overclocked by a tremendous amount (100+ MHz). The core clock can similarly be O/C by a healthy amount. Note: I am talking about the HD 2400 here. RivaTuner, however, should work with any discrete card that you have in your 755. Note: an AAM of 254 is pretty noisy. 128 is dead silent. 5) I saved the best for last :). My Dell Optiplex 755 came with a Q6600 (2.4 GHz). I managed to overclock it to 3.0 GHz … ;). Q6600 at default: 266 MHz FSB * 9 = ~2400 MHz or 2.4 GHz. Q6600 with “pin mod” = 333 * 9 = ~3000 MHz or 3.0 GHz. This “pin mod” applies to ANY LGA 775 processor and even older Intel mobile processors. Here is the guide I referred to. All you need are two pieces of tape to ground the pins on the Q6600 and then you can run your Q6600 at 3.0 GHz! Basically, you have to remove the heatsink and fan combo. There are 4 philips screws holding the heatsink and fan combo down. That’s it. Then, you remove the processor. Make sure to remember how the processor fits into the socket. You do not want to put the processor back in incorrectly!! Tip: take a picture of the processor in the socket before removing the processor! 2) After you remove the heatsink/fan, clean it. It is probably filled with dust. Try not to touch the thermal grease on the bottom of the heatsink. And do not remove the thermal grease as the manual states, unless you have new thermal grease to use. 3) To cut two pieces of tape small enough, use a nail clipper. I used a nail clipper and easily got two slivers of tape. 4) Put the tape on the processor pins as specified in the aforementioned guide. 5) Reinstall. Make sure you put your processor back the right way! 6) Start up computer. Your computer should be perfectly stable at 3.0 GHz. If not, you can up the voltage to the processor by putting more tape on the bottom of the processor … google “bsel volt mod” for more information. Still, the Q6600 is known to be a good overclocker and numerous people have overclocked the Q6600 to 3.0 GHz on air with no voltage increase. 7) Too much speed? Simply remove the two pieces of tape from the Q6600 and it will run at 2.4 GHz again. 8) This “pin mod” is 100% legitimate. I have been running my Q6600 with the “pin mod” for a month now, and I have encountered no stability issues. I initially expected a ton of more heat from overclocking, but my temps are 40-45 degrees Celsius idle, which is completely within reason. Under load, the temps jump to 60-65 degrees, but that’s reasonable as well. Someone try the pin mod out and let me know how it goes! This is less of a Dell Optiplex 755 specific mod, but if you have an external hard drive lying around, you can easily set up a RAID array with your 755. I set up a RAID 0 array with a 160 GB 7200 RPM Seagate hard drive and a 640 GB 7200 RPM Seagate hard drive. I think that the Raid 0 array has provided the biggest performance boost – even more than the pin mod :D.
Not quite SSD speeds, but I’m getting there :). I probably should have RAIDed two identical drives also, but whatever … the read speeds are double of what I got before … can’t complain :D.
Be sure to get the Pre-OS Intel RAID install driver, and to turn on raid in the BIOS. Everyone: what is your GPU temperature? You can check your GPU temperature using GPU-Z. Mine is around 59 – 66 degrees Celsius idle, even though it is winter and the ambient temperature is about 22 degrees Celsius. I have the standard HD 2400 Pro. And another question: have you guys encountered any memory failures? My 755 came with 4 sticks of RAM, and 2 sticks have already bit the dust … :\. The memory is Samsung-brand. 1) “Lapping” the CPU and heatsink. Lapping means polishing/sanding the CPU/Heatsink. Apparently, most CPUs and heatsinks are not perfectly flat, and this hinders the ability of the heatsink to conduct heat away. 2) Adding new thermal paste to the CPU. The thermal paste present on the processor is pretty low-quality – it’s some greasy pink silicone-based stuff. Plus, the thermal paste isn’t even spread evenly over the CPU. It’s not as if my CPU is running hot at 40-45 degrees idle, but I wouldn’t mind a drop in CPU temperatures. 3) Add new thermal paste to the GPU/HD 2400. I’m pretty sure thermal paste will help the temps drop on the HD 2400. 4) I also want to upgrade to one of the 80 Plus PSUs. My PSU in my 755 has a minimum efficiency of 65%, which is horrible. I’ll probably be getting one of the 380 Watt Antec EarthWatts. If anyone has any experience upgrading PSUs, let me know. And I also cracked open the stock Dell PSU and took a peek inside. Link below to the gallery. It looks to be a Lite-On PSU, so the PSU is of relatively high quality – for computer OEMs. Lite-On is apparently well-known in the server market. Here is a link to pictures of the inside of the Dell PSU! @billa18 – The chipset in the Optiplex 755 is the Q35 Express (Dell link – PDF). According to Intel, the Q35 Express is a PCIe 1.1 chipset (Intel link – PDF). While PCIe is generally backwards compatible, there have been issues where older systems didn’t understand cards using newer versions. This can often be fixed with a BIOS update. I have used various ATI Radeon HD 5xxx-series cards, which are PCIe 2.1, in the Optiplex 755 without any problems. his hd 6670 work on optiplex 755 with 305 watt? @billa18 – I don’t know about the 6670. The 5750 that I’m using requires an additional power connector not found on the stock 755 power supply. The 6670 doesn’t seem to need that, but their web page says “400 Watt or greater power” so you may need an upgraded power supply. HD 6670 works fine even with a weaker PS! Here is a link . Someone confirmed that work with 235W and fits into Optiplex 755 SFF. Please read Feedback section on this page! I think this is the best card for Optiplex 755/760 SFF. You can see that isn’t higher-wider than metal low-profile PCI bracket. 1) I want to upgrade the cpu to a Q9400, but I specifically need to know– do I need to change my heatsink if I upgrade the processor? The current heatsink in my machine is Dell part no. HR004. I noticed in response no. 115 LarryL asked about heatsink of Dell part no. J9761. And you mentioned it’s not on the part list. But I also see all through ebay that an O755 MT heatsink are the HR004 and J9761. I have a J9761 I had planned to use, but…. do I need to change the heatsink if I upgrade to a Q9400 processor? And what thermal paste brand do you recommend, Arctic Ice? another? 2) I also want to buy a card reader for my O755 MT. You mentioned about a card reader in response no. 125, “N-in-1 media reader”. I cannot find that on ebay, I searched by nomenclature, maybe just none available, but…. should I search by dell part no.? What’s the part number for the “N-in-1 media reader”? I assume it just slips into the floppy drive external bay? @Corey – sorry for the delay in approving / answering your comment. Your HR004 heatsink is listed as “Heatsink & Shroud Assembly (for Conroe & Celeron CPUs), Mainstream, MT, V2”. Looking at the O755 parts list, the Kentsfield and (Core 2 Quad Q6x00) CPUs use a GX003 heat sink / shroud. The J7961 doesn’t appear on the O755 parts list, but it is on the O745 list. The HR004 does appear on the O960 parts list (the 960 is an improved 755) with a description of “Heatsink & Shroud Assembly, 95W (Performance BJMT) V2”. So it appears that the HR004 is good to 95 watts, which conveniently is the TDP of a Q9400. The Kentsfield CPUs are 105W parts, so the GX003 probably has slightly better performance than the HR004. Your existing E6550 is a 65W part, by the way. To answer your second question, the media reader is a TH661 or GT399 (interchangeable) and the cable is a GH483. If you’re replacing a blank filler, you’ll also need the shoulder screws if your filler doesn’t have them stored on the back. If you’re replacing a floppy drive you can just re-use the ones from there. I see a few on eBay that have the drive + cable + screws. Re: the HD 6670 in the Optiplex 755. Have run up 2 of the 755 SFF with the HD6670 and they are both running great. Reading a few of the reviews i managed to set the card to run very stable at 865 MHz and the memory at 1150MHz. Also running them with 8gb ddr2 6400 and Q9550 CPUs. tried the ddr2 8500 but the MB only read it as 800MHz and when i tried the Q9650 CPU there was no marked improvement. I have now installed a 120gb SSD for giggles and love the 30 second startup. its a PC too old but would you suggest me to buy it? the tower one? can i upgrade its RAM, what type of RAM does it have ddr2 or 3? and would it be possible to move the system to another casing in order to make room for a Graphics card? I am not a serious gamer but i will play games like GTA IV, NFS Undercover etc. the BEFORE 2010 games. if its possible to add a graphics card, suggest a good one compatible with it. im a noob about computers and the shopkeepers are always willing to get every single penny out of my pocket. I don’t trust them. @mikaelmoon – If you don’t already have a system, I’d suggest looking at the Optiplex 960. It is a slightly newer version of the 755 and supports 16GB of RAM compared to the 8GB on the 755. The minitower has the most flexibility for expansion cards. As you move to smaller and smaller cases, it will become harder to find a video board that fits. This is very much a trial-and-error process as the graphics card manufacturers don’t provide all the measurements you’d need to see if a card would fit before buying it. I’d suggest staying with the cards I mentioned in my original article or one of the cards that someone else has reported as fitting into the case. Memory is DDR2 (PC2-6400). You probably wouldn’t want to try changing the case – while Dell doesn’t do the thing with wierd, incompatible power supplies any more, the ribbon cable to the front panel lights, audio jacks, USB, etc. is still unique to the Dell and you’ll lose those functions and need to make up a special cable to use them in a different case. I’ve been happy with the HIS 5750 cards. That’s about the maximum performance that will fit into an Optiplex 755 / 960 chassis (see my reply to another comment right after this one). This is actually on an Optiplex 960, but I wouldn’t expect the scores to change much on a 755. It is interesting that you’re only seeing 7.1 for the graphics on a newer card which you’ve overclocked. I’ve occasionally checked to see if there’s a single-slot graphics card which will fit in the 755 / 960 with higher performance than the 5750, and I haven’t found anything better than a 10% improvement, so I’m still running the 5750’s in my systems. The hard drive in my report above is the WD3000HLFS from my original blog post. On another 960, I’m running a pair of Crucial C300 256GB SSD’s. That system is used for heavy video editing and the SSD’s really help. Running all mine in the 755 Small Form Factor so i’m stuck with the low profile HD 6670. Can’t change the PSU either unless i add in a pico 120W PSU. Not sure if I can post a pic here of the display set up but it has had no problems at all. I got what was called a “Dell Optiplex GX755 3.0GHZ C2D 250 HD 4GB Win7 Ultimate” on ebay in July to replace my son’s emachine that died. Not sure what the GX means. I immediately yanked the power supply and put in the 500 watt supply I had previously put in the emachine. I also installed the GTX220 video card from the emachine. My son is very happy with the comp but I keep thinking of ways to do even more. I am toying with getting a 128gig SSD for OS as the hard drive occasionally gets a little noisy, and that worries me. However I am intrigued with your use of ReadyBoost. How do you think that setup would compare to a budget SSD performance? @msw48 – I don’t believe the GX755 was ever a model number that Dell used on their own direct sales market. The only ones I’ve seen with GX755 were ones sold at “Big box” stores like Wal-mart, generally as refurbished units. Presumably these are systems that came off short-term business leases, checked out / updated, and then sold in discount stores. As far as ReadyBoost goes, I’m using it on 2 of my systems that started out as O755’s (they’re now O960’s, which are functionally very similar but have a much nicer case). The 3rd system (the one described in the “upgrade project” blog post) is running a pair of Crucial C300 256GB drives, one as C: and one as D:. That’s mostly because I do a lot of the video editing I capture on my race car (click here for a sample) and having 2 fast SSD’s really helps. Since I wrote those posts, Seagate has come out with a hybrid SSD drive (the Momentus XT), where the drive attempts to figure out what should be on the hard disk part and what would benefit from being on the SSD part. Windows doesn’t have to manage or monitor it, which it does need to do on ReadyBoost-type media. A pure SSD would be faster than either of those methods. Prices have been coming down, and I believe that the SATA interface on the 755 is only SATA 2, not SATA 3, so the highest-permforming drives would be restricted by the slower disk controller in the 755. Unfortunately, in the race to add performance and increase capacity, the SSD vendors are moving to smaller and smaller cell geometries, which means that any given cell has a much smaller write lifetime than on older SSD drives with larger cells. Some of that can be worked around with more intelligent firmware in the drive, both for smarter wear leveling and error recovery. Most people looking for pure-SSD levels of performance will probably trade their system in (or hand it down to a friend / relative) before the SSD end-of-life happens. If you’re looking for a system that you will run for many years (My Optiplex 755’s had been running since before my January 2008 review and are still running now, nearly 5 years later), you may need to be more concerned about SSD life. I believe that normal end-of-life on a SSD means that you can’t write anything new to it, but you can still read data from it. These days a cheap USB external drive caddy (like the Western Digital Passport series) would let you back up the whole system in a few hours. I believe the only warranty calls I’ve had on any of the 3 were one for a moaning power supply fan and one where support decided I might have a bad memory DIMM, so they were replaced pro-actively and closed out the service call with “if it happens again, reference this call and we’ll decide what to do next”. It turned out that there’s a default BIOS setting (SERR Enable, I think) which conflicts with add-in ATI graphic cards (including the ones Dell ships these systems with). I am thinking, now, to give the ReadyBoost a try, next time I can lay hands on the O755. It resides about 1000 miles from my location. I have asked my son to “log” the start-up time so we will have an idea if there is any improvement. We’ll see what kind of attention span we get from a 14 year old. I have hopes that this computer will get my freshman son through high school. Perhaps the SSD can wait until half way through high school, once the “newness” wears off. By then, it may need more RAM, too. For now, he is quite happy with it, as is. BTW, do you know if ReadyBoost will run off a SDHC, assuming I installed one of those media card bays? Thanks, and I am now looking forward to that new blog article? Just upgraded Optiplex GX620 MT to Optiplex 755 MT, using the board OGM819 with Core 2 Q9550. By surprise Dell changed the front panel connector on the board so CN312 front panel board with XT029 cable was needed. Also heatsink with shroud J9761 fitted. Generic PSU of 600W installed as the original one went to silicone heaven. Using it as an office computer so running with integrated VGA. We’ve got an O755 in a Minitower with an E8500 and 1G of PC2-5300 RAM running Windows XP… I feel like the RAM and the OS and the fact that no one has been maintaining it are what’s causing it to run the way it is (slow). Are any of the quad-core CPUs a worthy upgrade? If I do or do not upgrade the CPU, what’s the best move in RAM? I’m definitely going to upgrade the OS to a 64 bit Windows 7 install, to catch up to the rest of the office. Hi, Terry. I own a 755 SFF. I have added 8GB of DDR2, and a Radeon HD6670 LP (to be upgraded soon to the new HD7750 LP.) The system is currently still running the E6550 that came with it stock. I am having difficulty finding out what the max TDP the stock cooling in the SFF can handle. I would like to install a Q9550S which has a TDP of 65W the same as my E6550, but failing that, can I safely venture to 95W TDP? All of those are in plentiful supply on eBay. The Kentsfield CPUs are 95W to 105W, so you should be Ok with the UP048 heatsink. Make sure you update your BIOS to the latest version (currently A21) so you don’t get an “unknown CPU” error when you boot. You may also need a higher-wattage power supply. @EFDisaster – 1GB is a pretty small RAM size, even for XP. But it’s hard to say what is causing the system to appear slow. The first thing I’d suggest is launching Task Manager and looking to see what the percentage of “System Idle Time” is. Make sure to check the “Show processes from all users” box. The Performance tab in Task Manager will show you how much memory is used / free as well as page file usage (where Windows puts things if there isn’t enough memory for them all to stay resident). A virus scan would also be a good idea, just to make sure you don’t have something gobbling up CPU cycles. I’d suggest one of the free standalone ones (which boot from either a CD/DVD or from a USB memory stick). First and foremost, mad props for your noble act of helping people out! Kudos! I was amazed at your story that I’ve decided to go the 960 path and emulate your setup. Well, I got one at eBay for $80. I’m planning to use it for converting my Hi-8 videos into digital form(if that makes sense) and scanning more than a thousand old pictures and 35mm negatives of my family. I also plan to use this computer for some light games(scanning a 35mm negative takes 15 mins as per manufacturer, so it would be nice to play while waiting). CPU:	Intel Core 2 Quad Q9400(I wanted the Q9650 but the price difference is about $100, and the speed difference isn’t much). RAM:	In the meantime, will use existing 2 GB and take 1 gig each from my two kids’ computers(755) which has 3gb each(I plan to upgrade my memory to 8GB and possibly 12 in the future, so please advise as to what RAM I should get) for a total of 4GB. Graphics Card:	XFX ATI Radeon HD6670 1 GB DDR3(I decided on this because it consumes less power and it’s cheap). External Drive:	WD Caviar Black 1 TB SATA III housed in a Rosewill 3.5″ SATA to USB & eSATA Ext. Enclosure (This is where I plan to save all my converted videos and scanned pictures). Power Supply:	I’ve been researching everywhere but I can’t seem to find a compatible and decent power supply for the 960. I’ve read about somebody going for the “425w Dell PSU (C921D)”. I plan on adding another external drive for backup purposes; may add a BluRay player, a 10-in-1 card reader or possibly a SATA replicator in the future. I also have installed a Creative X-Fi audio card. I don’t know if this would affect my choice of PSU but I’m using a DELL 2407WFP for my monitor. Based on my setup, could you please advise as to what PSU I should buy? 2) Type of RAM to buy. 3) Power Supply to buy. 4) For ReadyBoost, is there a newer, better alternative to the 32GB Kingston? I would very much appreciate a link to your possible recommendations. Here’s hoping you could find time to respond to this post. Thank you and have a nice day! i was just flicking through your page, and i thought you might be able to help me out, i just bought a dell optiplex 755 with 4gb ram and 250 gb hdd, but whenever i try and open a game (rpg, combat, strategy) it just tells me it needs dx9 or higher? i dont know what that is, i’d rather buy a card and install it myself that take it to a shop, i know i need a low profile, single slot card but thats about all i know, so i was hoping you could give me some pointers on what to get and how to fit it? TIA. @jadelouise – I assume you are using the motherboard graphics and not an add-in card? The motherboard graphics is an Intel GMA3100 and according to this PDF, it supports DirectX 9.0c. You could try running the Intel Driver Update Utility from here, as their drivers are often newer than Dell’s, and that might fix your problem. I suppose it is possible that your operating system install didn’t include DirectX 9 for some reason. Here is the official Microsoft download link for Directx 9.0c. If you install that, you should do a check for updates with Windows Update as there are likely lots of security patches for it in the 5+ years since it was released. If you are running anything newer than XP, you should already have DirectX installed. You could also read this article from Microsoft on how to use the dxdiag tool to verify your DirectX installation. If it turns out that you need an add-in graphic card, a large number of probably-discontinued models have been mentioned in the various replies above. The issue is that you’ll need one that’s a single slot, without a huge cooler, and that doesn’t need an auxiliary power cable (since the stock O755 supply doesn’t have one). If you have one of the smaller cases (SFF/USFF), there may be additional limitations on cards. It looks like the SFF will take some low-profile cards, but the USFF doesn’t even have an expansion slot for one. Several month lurker, thought I would share my experience. Have upgraded to a Xeon X3360 (which is a 95W part, running at 2.83GHz) – 40C idle, 56 under load and full fan – would like someone to try a x3370 or x3380 and report back! @rgunner – thanks for the comments! I guess Dell relaxed the CPU model checking when they discontinued sales of the O755. There previously was a CPU whitelist and anything not on the list would give a BIOS “Unsupported processor” error and halt. Performance memory is not fully utilized by most Dell systems (presumably the Alienware systems differ) as there’s no way to force specific timings. 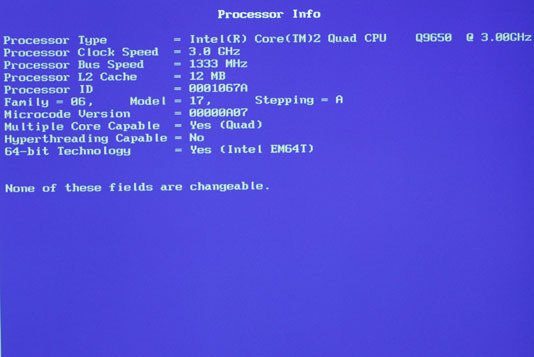 In some cases, it is possible to find a generic Foxconn motherboard close enough to the Dell version to cross-flash the generic BIOS, which usually has a lot more tweaks. My Dell Studio 1558 notebook is easier to do this to, as there’s an Award BIOS mod utility which can be used to show / hide all of the menu options that are in that BIOS. I’m a little confused as to how you’re going to get a Sapphire 7750 into a SFF box – as far as I know, those are all 2-slot full-height cards. They don’t even fit into the Desktop / Minitower versions unless you do some modifications to the bracket – and even then many of the cards hit the CPU heatsink/fan shroud. I’m running SSD’s in my Optiplex 960’s (which is what I switched to after 755’s). Unfortunately, I’m not getting the maximum performance out of them as the motherboard SATA is only SATA 2, while most SSDs these days are SATA 3 because they can transfer data faster than the SATA 2 limit. With a video card in the PCIe x16 slot, that leaves (in the DT/MT cases) the PCIe x1 slot and some PCI slots, none of which are capable of fully utilizing a SATA 3 add-in controller (the controller may talk to the drive at SATA 3 speed, but the bus is slower than that). On my file servers (which have 7 PCIe x16 slots) I’m using enterprise PCIe flash drives (4 or 8 flash controllers per card) as cache for the main 32TB filesystems. Thanks Terrry for the support, yes I know the SATA port is a “2” rev only 300MBs, but that SSD is all the difference in the world. As for the 7750, its somewhat newly released (before Christmas), check out 11202-10-20G at Amazon or Egg, there are already user review with the 755 SFF. You can also check out Geekbench, would like to see your 9650 scores there. Terry, found you on the web and you are a true O755 guru. Ok with that out the way let me explain my problem. I bought a used O755 about 4 years ago and it died corrupting the MBR on my C: drive. So I bought a mail-order, refurbished O755 with Vista Pro installed because I know the PC and it has served me well. When the refurnb arrived I installed the old drive so I( could recover all my data files and then fired it up. Everything worked fine except I had no sound. I checked and found that the PC did not have the Dell Sound Max driver installed. I went to the Dell site downloaded the recommended driver and installed it. I still have no sound output from the sound port in the back on the PC. I do hear sound from the system speaker. Can you please tell me how to solve this problem. Thanks. My first guess would be that the internal sound controller is turned off for some reason. This could be because it is disabled in the BIOS menu, or it could be that Windows thinks there’s a “better” sound controller and is trying to use that instead, even though there’s nothing hooked up to it. I’ve had this happen with ATI Radeon graphics drivers, which install a “HDMI Audio Device” or somesuch. For this second case, you need to Windows Control Panel / Sound (or similar, depending on Windows version) and make sure that the selected playback (and recording, if you use it) device is set to the on-board sound controller. I have recently acquired a small form factor Dell Optiplex 755 and already updated the chip to a dual core 3 gHz. Im now in the process of looking to upgrade the power supply in this pc it currently has a 275 watt in it I found this one and been thinking it should fit but not sure. http://www.outletpc.com/cc1246-ap-tfx40-400w-power-supply-tfx12v-80-plus-bronze.html any thought on other power supplies that would and give more wattage?